Vancouver, December 1, 2003 — St. Vincent's Hospital Foundation is hoping "I care" translates into "eye care" as it kicks off this year's Angel Campaign, asking donors to help raise $100,000 for a unique research project on eye-health for the elderly. The Centre for Aging and Health and Providence Health Care's St. Vincent's Hospital is leading the "Eye Health for Elders" research project that's a first of its kind in Canada. The Centre will use the hospital Foundation's Angel Campaign fundraising to improve the quality of life for older adults affected by vision loss or eye disease such as macular degeneration, glaucoma, diabetic retinopathy and cataracts. "As we age our vision deteriorates and the occurrence of eye disease dramatically increases," says Ann Corrigan, Executive Director of the St. Vincent's Hospital Foundation. "However, if caught early, further deterioration can be prevented and in some cases, even corrected. We're excited to be engaging the community to assist our patients through the Centre's important research. What could be a better gift than the gift of vision?" "This research will deepen our understanding of the eye-health needs of the elderly," says Taj Bhaloo of the Centre for Aging and Health. "The need for increased awareness, education and improved screening for eye care in the community, and especially residential care, is at the core of this important investigation." Bhaloo adds that in the coming years, researchers will study how poor eye health relates to other diseases as well as a decline in mobility for the elderly. It is estimated that at least half of the vision loss in the elderly can be improved and 25 per cent of the cases are preventable if caught early. "We often take our vision for granted and don't realize the full affect vision loss can have on the overall health of the elderly," says Bhaloo. "Those who suffer from vision loss have an increased risk of depression, heart disease, poor oral health and hip fractures, among other health problems." Over the last 14 years, the St. Vincent's Hospital Foundation has raised money through its Angel Campaign for new equipment, technology, research, programs and services for St. Vincent's Hospital Heather site, the Langara and Brock Fahrni residential-care facilities and for the intermediate care facility of Youville Residence. 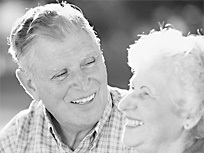 In the coming years, the Foundation will continue to focus its fundraising activities to benefit the elderly at Langara, Brock Fahrni, Youville Residence and for the planned new redevelopment of the St. Vincent's Hospital, Heather site into a state-of-the-art Aging and Healthy Living Institute and residential-care facility.